Leave it up to Jerry Jones and the Dallas Cowboys to try to upstage the NFL’s opening night. 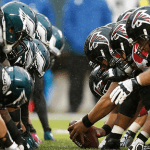 Hours before the Atlanta Falcons and Philadelphia Eagles open the season Thursday, the Cowboys owner announced a first-of-its-kind-deal in NFL history. WinStar World Casino Resort has become the official casino sponsor of the Dallas Cowboys, marking the first team to have such a partnership. The proximity between the casino, which rests 85 miles from AT&T Stadium where the Cowboys play home games, is what made sense, Jones said. Jones announced the sponsorship a week after he and fellow owners relaxed league rules to allow teams to accept sponsorships from casinos and daily fantasy sports sites that operate sportsbooks. He seemed excited to be at the front of the NFL’s expedition into the frontier of legal gaming. 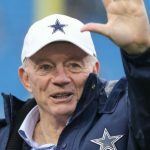 Parkinson stopped short of saying the casino would have Dallas Cowboy slot machines, but Jones chimed in to say the Cowboys would be visible at the Oklahoma casino. “The club will be having many of our social activities centered around WinStar. We expect a lot of presence, of our presence, at WinStar,” Jones said. Sixty-percent of WinStar’s workforce, or 2,300 employees, are Texans, Parkinson said. 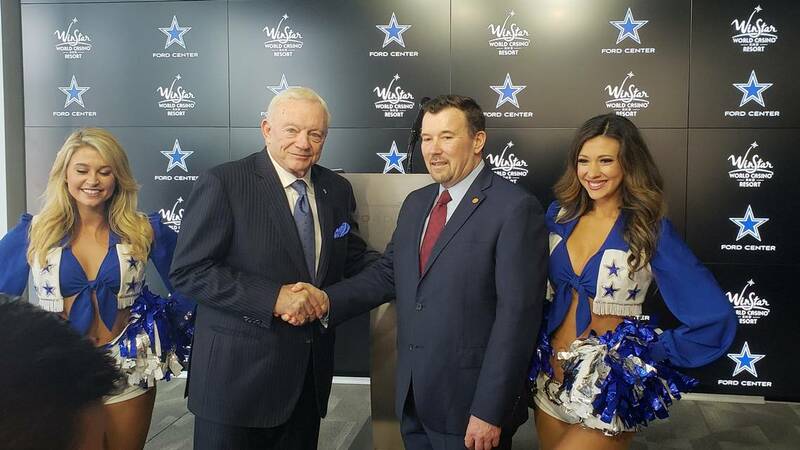 “This unprecedented designation gives our patrons and Dallas Cowboy fans the chance to blend their passion for both world class leaders into unique experiences at both AT&T stadium and WinStar world casino and resort,” Parkinson said. The relationship between the league and gaming industry has always been present, though it may have been relegated to the NFL’s dark corners. NFL commissioner Roger Goodell is on record saying sports betting could put the league’s integrity at risk, but Jones has bucked that stance publicly. “I don’t think in any way that gaming compromises the integrity of the game,” Jones said to 105.3 The Fan in December. A recent study supports Jones theory that sports betting will increase the game’s popularity. Nielsen Sports commissioned a study by the American Gaming Association which concluded that the NFL will add $2.3 billion to its annual bottom line. The study says that the majority – a whopping $1.75 billion will come as a result of “increased consumption and engagement with the league.” Another estimated $573 million will come from sponsorships and advertising with gaming entities. Jones and New England Patriots owner currently hold investments in DraftKings. 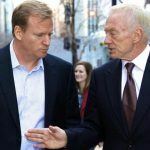 Jones has invested in through an entity separate of the Cowboys and owns less than five percent of the company, ESPN reported. The Miami Dolphins are currently in an 18-year agreement with Hard Rock International to play home games at Hard Rock Stadium. That partnership has led to speculation that Hard Rock’s new Atlantic City casino property will not take bets on pro football.